Below: Left: Fresh enoki mushrooms with roots. Right: Enoki mushrooms rolled in pork prior to being cooked. To make the sauce: Dissolve the cornstarch in the dashi. In a sauce pan over medium heat, bring the dashi and cornstarch, mirin, and soy sauce to a boil. Then reduce the heat to maintain a gentle simmer. Stir occasionally until you achieve the desired consistency (approximately 2 minutes). It should be slightly thick when you remove it from the heat. It will continue to thicken as it cools. To adjust the thickness of the sauce to your taste, you can add more dashi if it’s too thick or you can simmer it further if it’s too thin. Serve slightly warm or at room temperature. 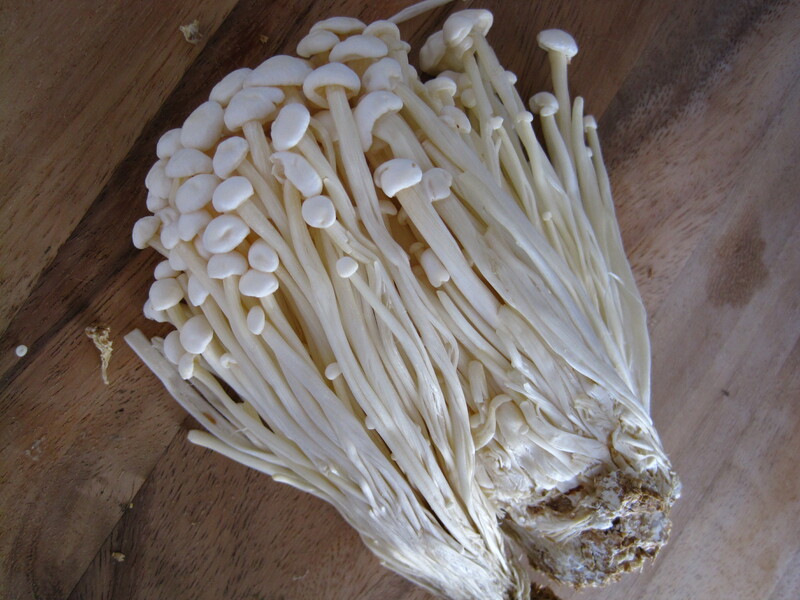 Cut off and discard the dark, clumpy roots of the enoki mushrooms leaving them about 2 to 3 inches tall. Separate them into 14 bunches. Working with one slice of pork at a time, arrange the slice of pork so that it is flat on your work surface and that the length of it is running vertically towards you. 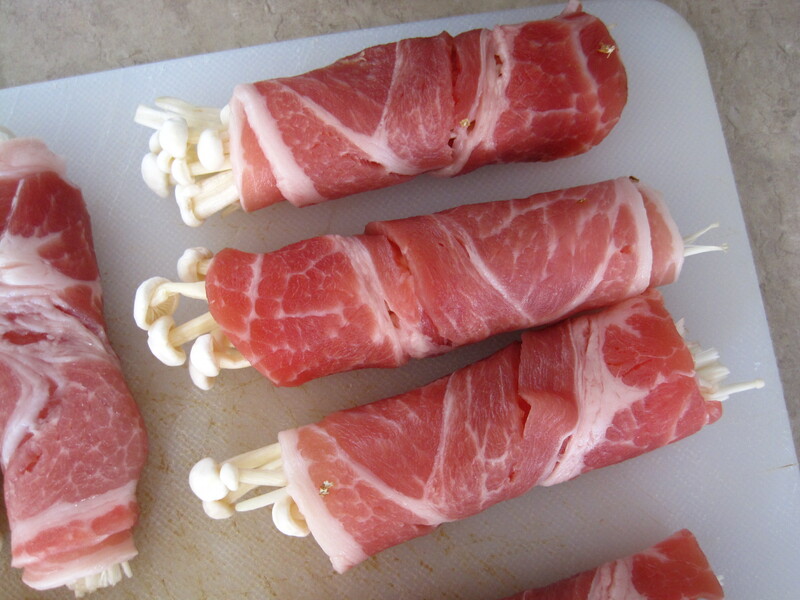 Sprinkle a tiny bit of salt onto one side and place a bunch of enoki mushrooms on the end of the pork closest to you. Arrange the enoki mushrooms so that the caps will be sticking out of the pork roll. Roll up the pork all the way around the enoki mushrooms tightly and set it aside, seam side down. Repeat with the remaining pork and enoki mushrooms. You could cook these on a grill, in an oiled pan, in the oven, or on a griddle. I used a griddle over high heat to simulate a teppanyaki griddle. Grease the griddle lightly with vegetable oil when hot. Then place the rolls onto the griddle seam side down 2 inches apart. Cook for 2 to 3 minutes per side until the meat is cooked through and carmelized. Pretend that each roll has 3 to 4 sides. 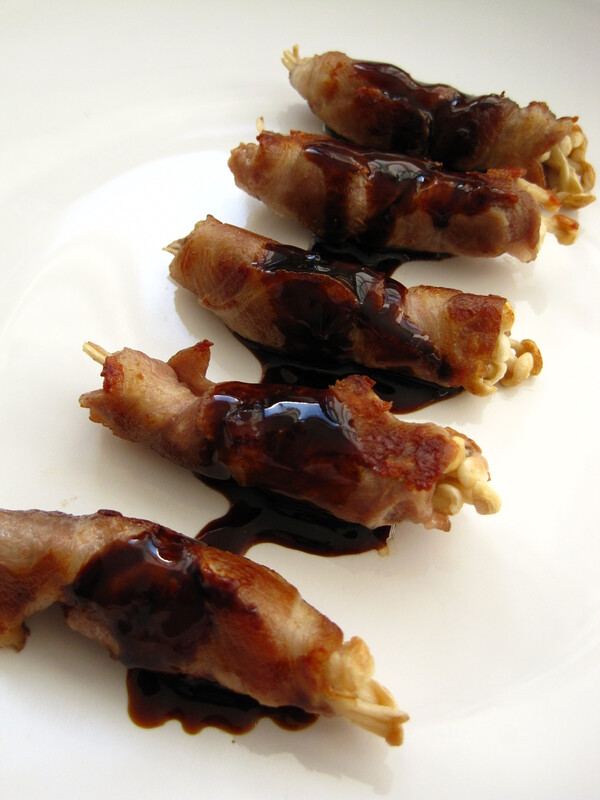 Plate the rolls and drizzle with the sauce or serve the sauce on the side for dipping.